Yoji Kondo was a scientist, a person, a colleague, a friend to look up to. He dispensed wisdom with an unassuming smile, he put science over bureaucracy, and gently succeeded to run projects that way, accomplishing and facilitating major scientific endeavors. His vision has been very influential to NASA and UV astronomy for decades. His recipe for success of any project was – as he would put it – “very simple”: just surround yourself with the best people. He liked to always credit his team and his collaborators for any accomplishment, a trait for which he deserves the bigger credit in turn. Yoji headed the astrophysics laboratory at the Johnson Space Center during the Apollo and Skylab missions. Then for fifteen years he led for NASA the IUE mission, an international scientific satellite performing UV spectroscopy, and doing it so successfully that operations were extended for over 18 years. If IUE is perhaps the best remembered success, Yoji’s contribution to UV astronomy goes back to NASA sounding-rocket flights with Al Boggess in the late ’60s, followed by observations during extravehicular flights with NASA’s manned Gemini XI, again in the late 60’s. In the ’70s, Yoji participated in the S-019 UV spectroscopy experiment aboard SKYLAB, as well as developed his balloon-borne ultraviolet spectroscopic payload, BUSS. The BUSS payload and IUE had significant European participation. 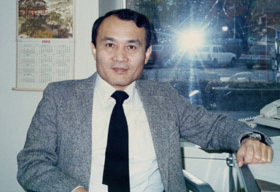 Later, Yoji was NASA Project Scientist for EUVE (Extreme Ultraviolet Explorer), another very successful space telescope surveying the sky in Extreme-UV wavelengths from 1992 to 2001. More recently, Yoji was co-investigator on the very successful Kepler mission. Yoji Kondo also valued and enjoyed teaching, and held concurrent appointments at several universities while working as a NASA scientist. Throughout his long and rich life, he touched in a very positive way the careers of so many young scientists. Retired from his NASA position at GSFC, he never retired from doing science, and never stopped thinking about future projects. During occasional lunch meetings with Yoji and his closest collaborators, conversation about projects, new data, collaborations, was always prompting his interest and vision. But it was also enriched by stories of his life, from when he was a boy not far from Iwo Jima, after the bomb, carrying buckets of water for his older brother to keep their house wet to avoid that it may catch fire, to creative quick problem solving during the time of the Apollo missions, to how he ’borrowed’ pleasant traits from this or that colleague to create his literary characters. Because, besides leading science projects and NASA missions, teaching martial arts, and enjoying Italian opera, Yoji wrote several science fiction books, using the nom de plume of Eric Kotani. About them I will only recall one thing he was jokingly proud of: one of his fiction books contains an actual Hertzsprung-Russell Diagram, the only such scientific figure ever published in a science fiction book. Yoji has been president of the IAU Commission on Astronomy from Space, president of the IAU Commission on Close Binary Stars, and president of the IAU Division on Variable Stars. A prominent figure for half a century of UV astronomy, Yoji was a rich, generous personality and scientist, with much to tell and to teach, his ’simple’ ways making his influence all the more effective. Farewell Yoji: your work, your teaching, your friendship live on in generations of astronomers.